Panasonic's 2012 LED televisions have excellent picture quality, the 1080p 240Hz panel has a new feature that Panasonic calls "1920 Back Light Scanning" that manipulates the back light to simulate 1920Hz and smooth out fast scenes and judder. Black levels are powerful and colors really pop on this 55" LED TV. 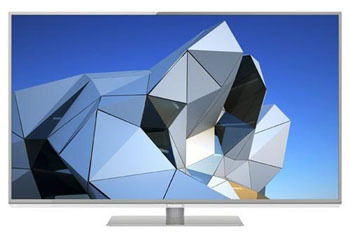 The DT50 is another line of new, larger LED back lit LCD televisions from Panasonic. 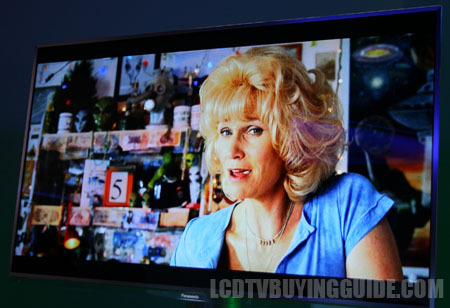 Prior to 2012 Panasonic kept larger sizes and top end features in their plasma line but they have introduced some high-tier larger LED TVs this year. The TC-L55DT50 is the second form the highest tier and contains most of the features of the WT50 though it lacks some of the social netowkring features and it has a different look. The DT50 has the same 1920 Back Light Scanning feature as the WT50. The 240Hz panel is paired with a scanning backlight to simulate a 1920Hz reponse rate. This helps the LED TV to smooth out judder in film content and remove blurring from fast action. In the DT50 conversion of 24p content is handled by what Panasonic calls the 24p Cinema Smoother. The 24p cinema smoother takes 24p film content and interpolates extra frames into the content to smooth out the judder sometimes found when showing 24p content on televisions with a base 60 frame rate. 24 does not go evenly into 60 so conversion is handled by the TV's processor. This colorful shot of the DT50 in action shows good clarity, deep black levels and excellent background depth. The active 3D in the TC-L55DT50 shows a rich, detailed image with 3D content. Full HD Active 3D shows each eye twice (or more) than the resolution of passive 3D and this not only increases detail, it improves the overall depth and separation of 3D content. The DT50 has a thin aluminum bezel surrounding the panel, in the past we have complained about Panasonic not keeping up with the other manufacturers when it comes to aesthetics and for 2012 Panasonic has responded with many updated looks. The new stand is metal with a neck than angles forward and complements the bezel. The DT50 is about an inch in depth. Along with a full web browser that is new for the 2012, the DT50 comes equipped with the full Viera Cast Internet TV suite. It features access to streaming video apps from Hulu and Youtube, social networking like Twitter and Facebook, online radio from Pandora and more. With the Viera Remote app you can control the TC-L55DT50 with a smartphone or tablet. It supports use of the touch screen on your phone and the phone's built-in keyboard as well as displaying web pages and video from the TV to phone and vice versa.